Eleven Oaks Realty is proud to present their October 2018 Austin Multi Family Real Estate Price Report measuring activity in the Austin multi family market. 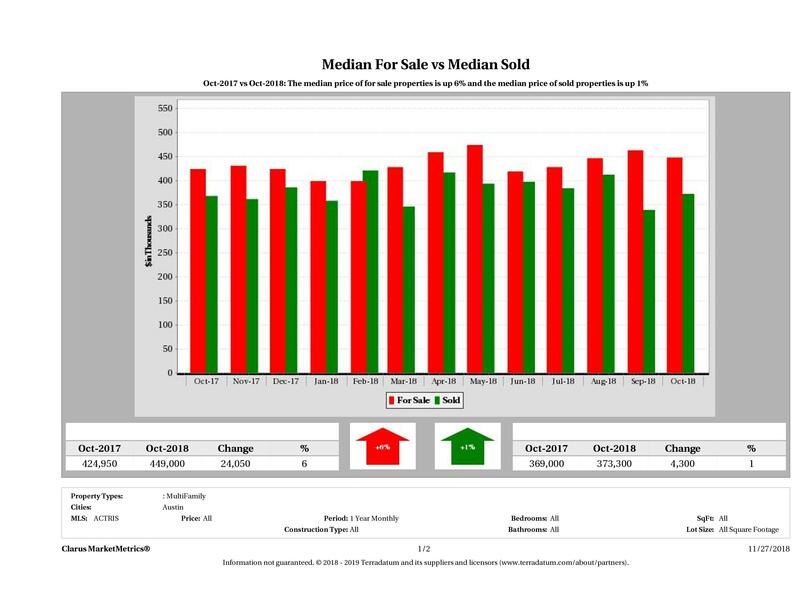 This report includes all multi family properties (duplex, triplex and quadplex) that sold in October 2018. 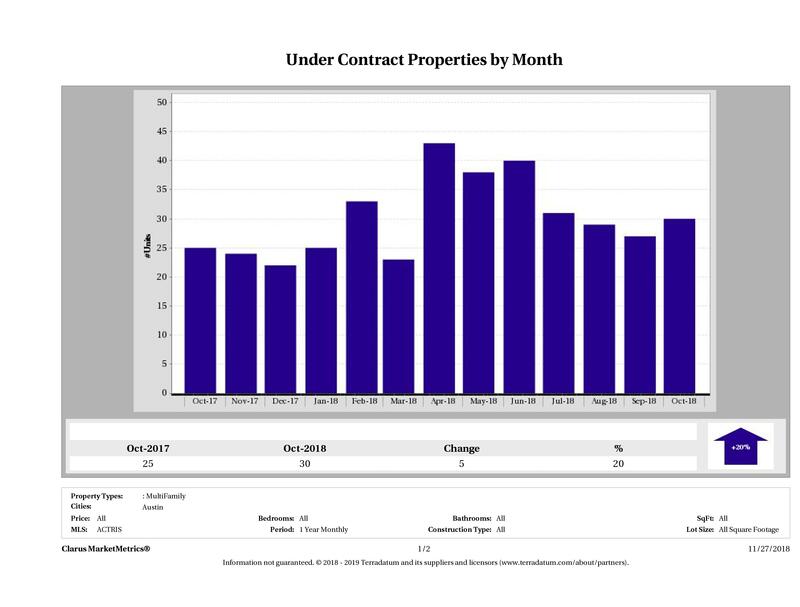 In October 2018, 30 multi-family properties went pending (under contract) in Austin compared to 25 in October 2017, showing a 20% increase in year over year numbers. The median home price of a multi-family property in Austin in October 2017 was $369,000 compared to $373,300 in October 2018, marking a 1% ($4,300) increase in year over year numbers. Median home price helps us see the distribution of multi-family properties sold and does not really give us an indication of the increase or decrease in a particular property’s market value. To analyze market value, we’d have to take an in depth look at a neighborhood. If you’re looking for something like that, please check out our Austin Property Values Report. 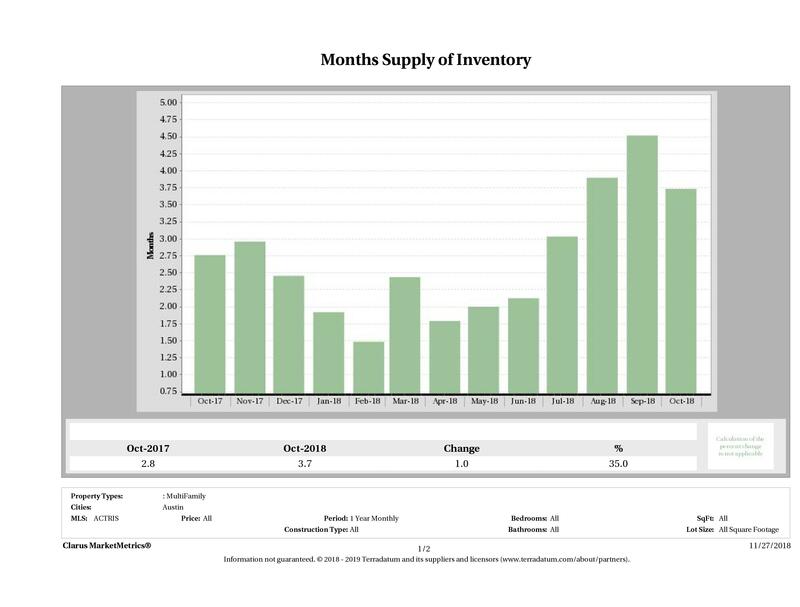 In October 2018, we saw 3.7 months of inventory on the market, compared to 2.8 months of inventory in October 2017, showing a 35% increase in year over year numbers. Multi-family inventory has been low all year so this will be a welcome change for buyers looking for more choices. 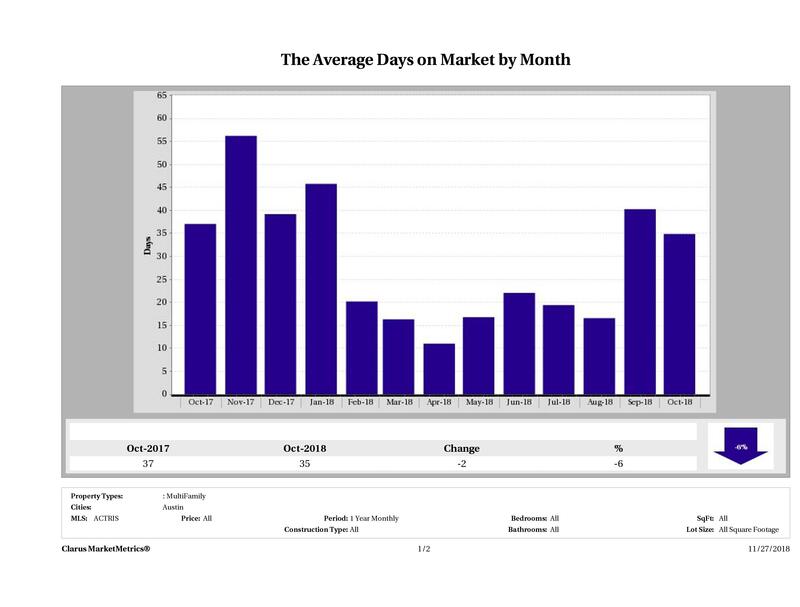 In October 2018, it took 35 days to sell a multi family property in Austin, on average, compared to 37 days in October 2017, marking a 6% (2 day) decrease in year over year numbers. Time to sell numbers increased quite dramatically in September. In October 2017, there were 12 multi family properties taken off the market compared to 19 in October 2018, marking a 58% increase in year over year numbers. If your Austin multi family property was priced right but it still didn’t find a buyer, maybe there was something else going on. The biggest culprits we see are incorrect info in the MLS, inaccessibility and poor marketing. Check out our Austin Property Marketing Plan to see how your homes would be marketed if we listed them. If you’d like our opinion on why your property didn’t sell email us at info@11OaksRealty.com. Having trouble selling your property? Check out our Austin Property Not Selling resources page to find out why. In October 2018, Austin saw no change in the number of multi family properties sold from October 2017 to October 2018. 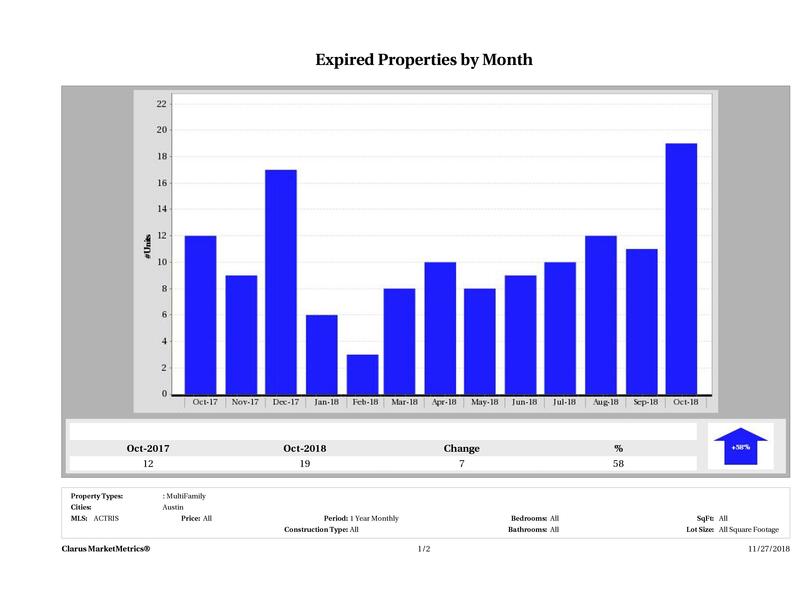 In October 2018 and October 2017, we saw 20 multi family properties sell in Austin marking no change in year over year numbers. 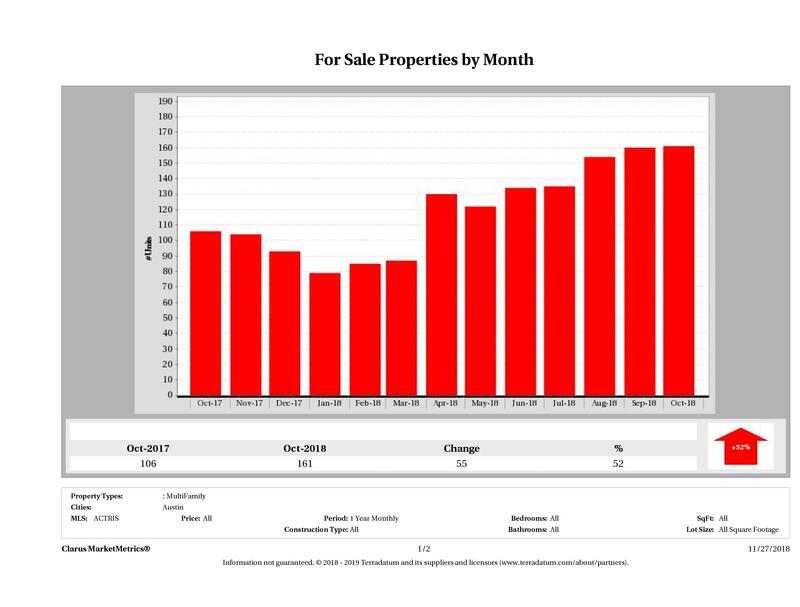 In October 2018, we had 161 multi-family properties for sale in Austin, compared to 106 in October 2017, showing a 52% (55 property) increase in year over year numbers. 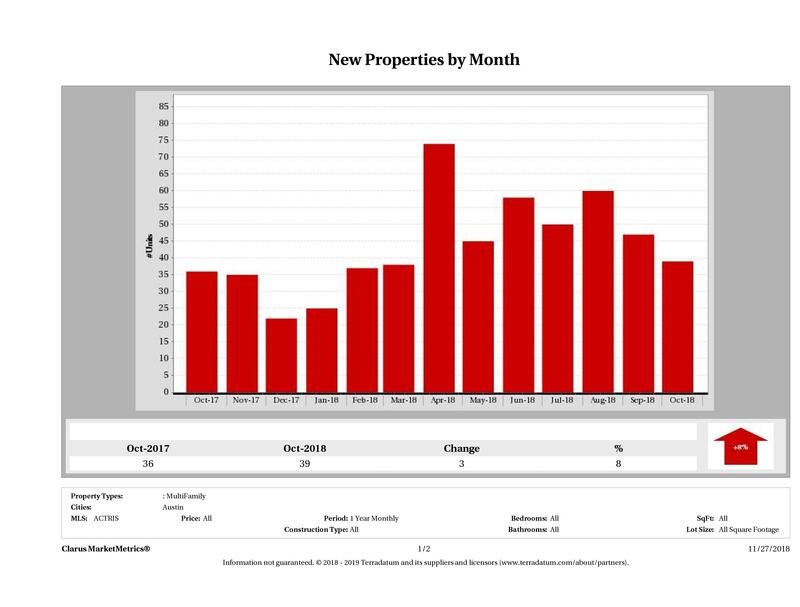 In October 2018, we saw 39 multi family properties introduced to the market compared to 36 in October 2017, showing an 8% (3 property) increase in year over year numbers. 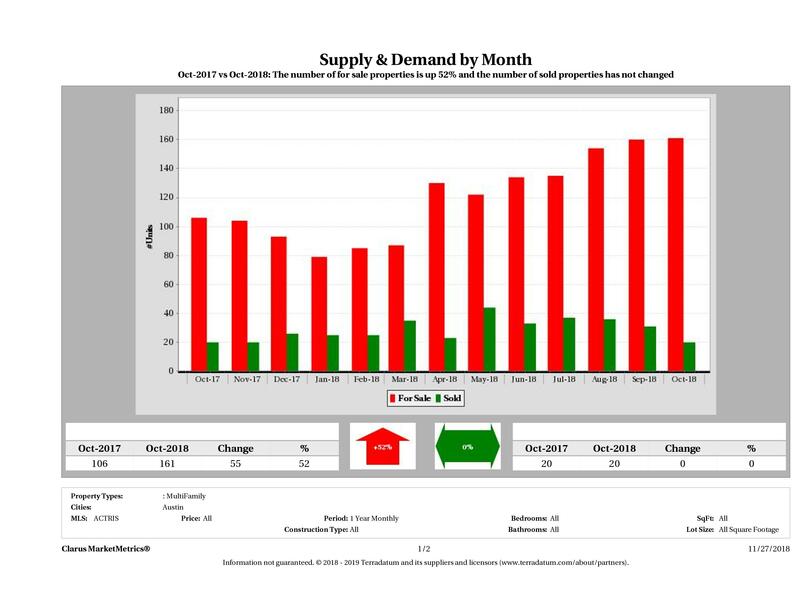 This month we saw a 52% increase in supply (number of properties for sale) and no change in demand (number of sold properties). This summer has been an extreme seller’s market in multi-family properties, but fall is looking like a mixed bag. 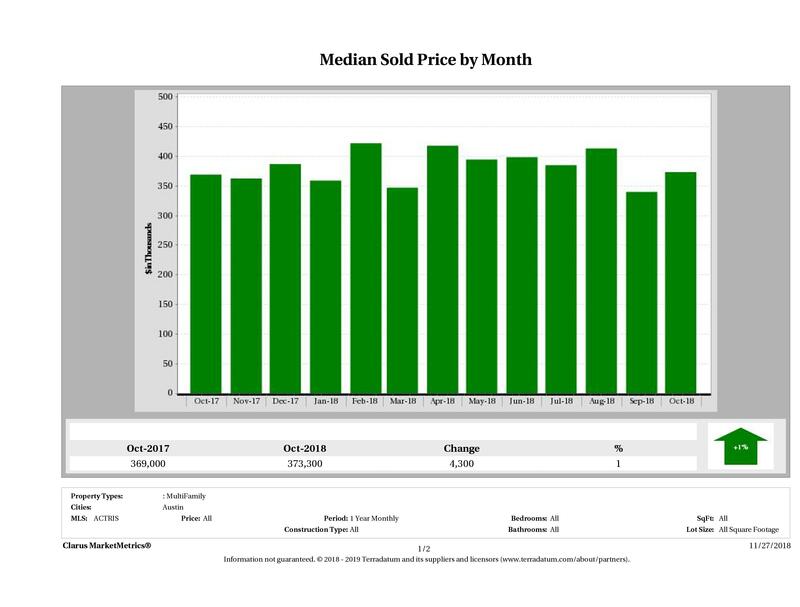 This chart compares the Median for Sale Price vs the Median Sold Price to show their relationship. In Austin, we saw a 6% increase in the median for sale price and a 1% increase in the median sold price of a multi family property in year over year numbers. The median for sale price of a multi-family property in Austin went from $424,950 in October 2017 to $449,000 in October 2018, showing a $24,050 increase. The median sold price of a multi-family property in Austin went from $369,000 in October 2017 to $373,300 in October 2018, showing a $4,300 increase. For those of you who prefer to see the actual numbers, we’ve included the figures for October 2018 Austin multi family sales below. The most expensive property that sold in October 2018 sold for $685,000 and the least expensive multi family property sold for $223,500. Multi family properties ranged in size from 920 sqft – 3,520 sqft with an average size of 2,240 sqft. The average price per square foot for a multi family property that sold in Austin in October 2018 was $199.70 with the lowest being $99.60/sqft and the highest being $652.17/sqft. It took, on average, 42 days to sell a multi family property in Austin and sellers received, on average, 93.56% of their original list prices. Looking strictly at the numbers, it appears the recommendation for this month is – it’s time to buy. 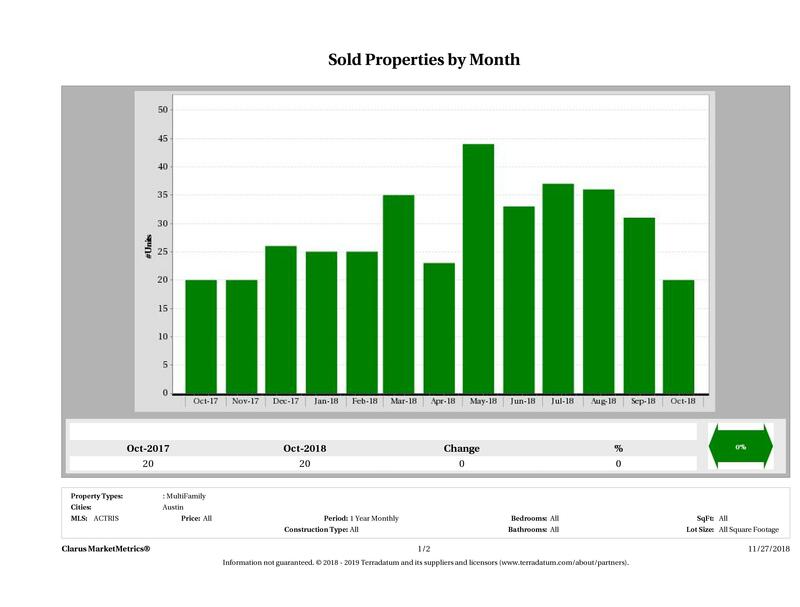 With inventory levels on the rise and prices essentially flat, it’s a bright month of stats for buyers. If you’re looking to buy, set alerts for new listings and scout them as soon as possible. Hire a Realtor who knows the multi family real estate market and has strategies for getting your offers accepted without increasing your offer price. Our team not only knows the market, but we also own several multi-family properties that have no trouble finding tenants. We can help you identify which properties will be the highest netting. Put our knowledge and experience to work for you and we’ll help you make money on your rental. For more info about buying a multi-family property, visit Buying in Austin. Looking to sell? Make your property stand out as a value. When buyers are excited about the potential of your property, they’re willing to pay more. If your multi-family property is located in a desirable area or good school district, you’re in an even better position as those are very hard to find. Spend some time preparing the property to meet the market and hire a Realtor who knows how to market multi-family properties. If you’re considering selling, work with a Realtor who has strategies to help you get top dollar for your home. Check out our 88 Ways to Sell Your Home Faster and For More Money for some tips on how you can prepare your home to meet the market. We are entering the busiest time of year. Do what you can to prepare your home now and you’ll be ready at the perfect time. For more info about our Home Selling Program, check out Selling in Austin. Questions About the Austin Multi Family Real Estate Price Report? Do you have questions about this Austin Multi Family Real Estate Price Report? Call us at (512) 827-8323 or email us at info@11OaksRealty.com and we’ll help you in any way we can. If you’re looking to buy or sell Austin real estate, don’t forget to check out our Buyer Resources and our Seller Resources for more tips.